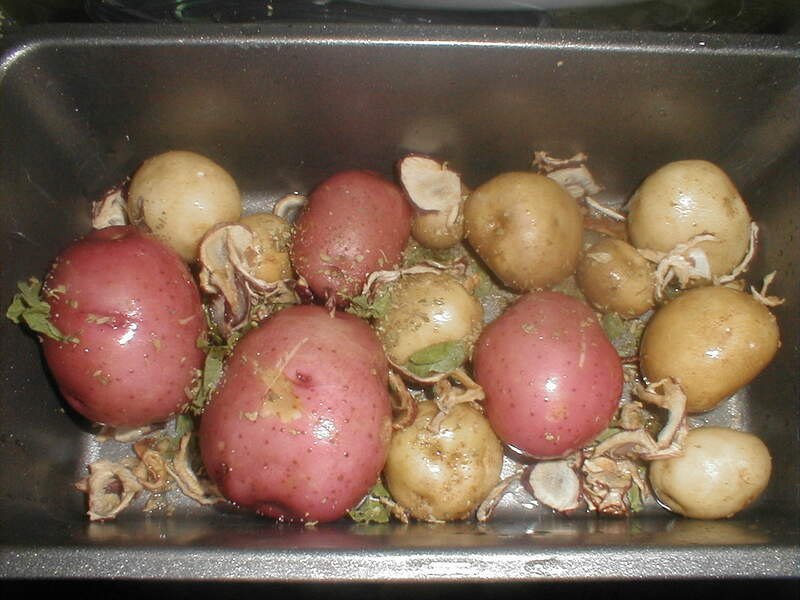 If you want to cook vegetables the lazy way, bake them or roast them. In the oven, vegetables cook without giving you any trouble at all. Preparation is minimal, but the flavor, optimum. Serve roasted vegetables as a flavorful side dish or, adding some herbs, cheese and other seasonings, you have the making of either a wholesome appetizer or light meal. There is nothing easier than cooking in the oven and you don’t need a lot in the mater of utensils either. If you are going to use the oven for any recipe, makes sense –and it would not take you long- to pop into a few vegetables at the same time. Not only you achieve double but vegetables cooked in the oven are tender, light, nourishing, and demand no attention, practically set and forget. Size matters; too small and you’ll have skin and dried flesh. Looks are also important; as you cannot get rid off tough bits or marks before baking them. Select vegetables of a similar size –they’ll take the same time to cook- and blemish free. If not of the same size, pop the smaller ones in the oven some time after the other. Pierce the skin once or twice before cooking to prevent the skins from breaking while cooking because of accumulated steam underneath. Artichokes – come out great in the oven and don’t need much preparation. Scrape the outer leaves and pierce a couple of times. Eggplant and zucchini – choose medium sizes; rub with a clean cloth or peel them. Once cooked, peel or slice and serve with herb butter, or stuff them with savory fillings. Roasted eggplant is the base for many cold dishes. Onions – will turn out delicious. Top, tail, and cut twice on the top, cross shape, so they’ll open; no need to peel. Peppers – roast whole; peel and de-seed once cooked. Don’t pierce them before. Roasted red pepper salad is delicious. Potatoes – baked potatoes are one of the cold season pleasures. Choose medium sized ones, wash, and pierce the skin. Rub oil and salt to get a crunchy skin. 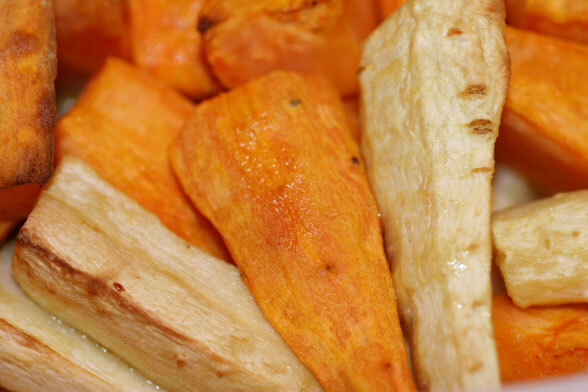 Parsnips – prepare as potatoes, bake whole, halve if too big and roast with the cut down on a greased pan. Tomatoes – great in the oven; wash and cut along the top –just a shallow cut- it will prevent accidents and make the task of peeling them easier. Rubbing the skin with just a little oil or butter will produce more tender results. Then you need a shallow pan for the oven –metal loves heat and cooks faster- and you are good to go. There are potato racks and such, but you don’t really need them. Oven temperature or position in the oven is not an issue, a blessing if you want to cook them along some other dish. A temperature of 375-400° F (180-200° C) is ideal, but you can roast them at lower temperature for longer. Just turn once while cooking. You can get creative with herbs and spices. Potatoes – 45 minutes to 1 hour 15 minutes. How do I serve roasted vegetables? Peel, deseed, dress with oil and season to taste with salt and pepper. There are a few other ideas. Halve artichokes and serve with vinaigrette or mayonnaise. Halve roasted eggplant, remove inside pulp with a spoon and combine with tomato sauce, and chopped parsley, season with salt and pepper and stuff the eggplant shells with this mixture. Peel and deseed roasted red peppers, sauté 1-2 cloves garlic, peeled and sliced, in a little olive oil. Add red peppers. A great side dish for roasted meat or fish together with potato mash. Halve baked zucchini, cut up inside pulp with a spoon, combine with cooked ground meat and white sauce, stuff the shells, sprinkle grated cheese on top and grill to melt the cheese. Mustard flavored butter or grated cheese are a good garnish for roasted halved parsnips.